Hands of women in the garment industry. Concerned about ongoing protests in Cambodia which have virtually shut down the garment industry, the United Nations labour agency today called for an end to violence and destruction of property, and encouraged the factories to be reopened. “The risks arising out of the current situation are significant for a sector which continues to operate in an intensely competitive international environment,” the UN International Labour Organization (ILO) country offices for Thailand, Cambodia and Laos said in a news release. Members of the opposition have been boycotting the Cambodian National Assembly for more than five months in a reported attempt to oust Prime Minister Hun Sen, whose win in the last election extended his 28-year rule, alleging vote-rigging and calling for a new election. They have been joined by the garment workers pressing for higher wages. In reaction, manufacturers yesterday shuttered hundreds of factories, stopping an industry that supports 400,000 jobs and accounts for some $5 billion per year in exports. The disruption, termed “a cause for significant concern” by the UN offices, may impact significantly the industry’s revenues and tarnish the country’s reputation among international buyers. “The current unrest highlights the necessity for Cambodia to adopt a more modern and robust minimum wage fixing system based on international good practices, using objective criteria and data,” the ILO said. Representatives of the Labour Ministry apparently met with unions yesterday to discuss wage demands, but the meeting ended without a resolution. The ILO called on all parties to fully implement a working agreement signed in 2010 and renewed in 2012 by the main trade union and the Garment Manufacturers’ Association in Cambodia (GMAC), the trade body that represents some 470 factories making and exporting garments. The agency also said that a legislative framework for improving industrial relations has been developed in the form of the draft trade union law, and called on the Government to finalize and full implement it in keeping with ILO principles and ratified international labour standards. 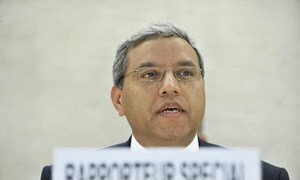 An independent United Nations human rights expert today urged Cambodian authorities to continue to exercise restraint amid daily demonstrations in the capital of Phnom Penh, while also praising the increasing democratic space allowing people to comfortably express themselves in the streets without fear of retaliation and warning them against resorting to violence.